As the weather continues to cool, legions of us turn to the comfort of our kitchens. Firing up the oven warms not only the house, but the heart as well and there's no time like fall to curl up with a good cookbook, especially when so many good ones are there for the devouring. The New York Times takes a look at the most recent offerings on the culinary adventure horizons and the range is intriguing: from a ranch wife in Oklahoma (Ree Drummond's The Pioneer Woman Who Cooks) to former Craft chef, Marco Canora's sophisticated Salt to Taste, which focuses on the simplicity of high-quality, seasonal ingredients to musings on macaroons, and only macaroons. There's a pick from New Orleans's own John Besh, called My New Orleans, which NYT prizes for its coffee table appeal (or for the gourmand in your life who already has everything else including that weird rack from which to hang bananas.) In it, Besh credits the confluence of traditions and culinary styles of the French, Italian, Cajun and Creole for New Orleans' unique foodie appeal. 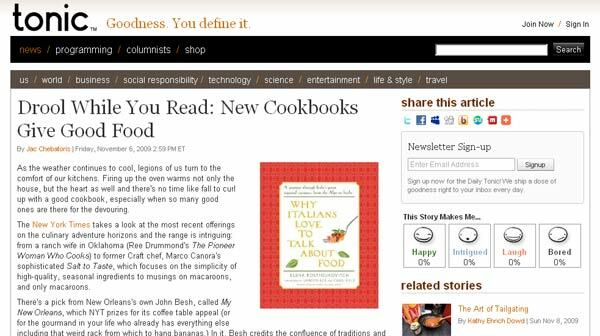 Most-fun title would be Why Italians Love to Talk About Food, which provides no recipes, but is a more anthropological look at how Italian people come to food: by knowledge of "agriculture, festivals and cooking." There are a host more to examine here, and sure to be something to whet your appetite, both for the food described within, and the passionate literary exploration of such a tasty subject.